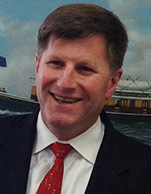 Bob Burke is the founding CEO of Ridgebury Tankers. Ridgebury has a fleet of modern crude and product tankers. The Westport, Connecticut Company continues to acquire vessels with primary focus on medium range (MR) refined product carriers and Suezmax crude carriers. Bob has over 30 years of experience in the shipping industry.